All German-made Framus guitars will now ship with Graph Tech Ratio tuned machineheads. The tuners have individually adjusted ratios for each string, ranging from 20:1 to 39:1. It essentially makes tuning quicker and easier, especially on the higher strings. The tuners are also locking, and are available in both rosewood and ebony. For more information visit the official Framus website. From now on, all "Made in Germany" Framus guitars will be equipped with Graph Tech Ratio tuned machine heads. 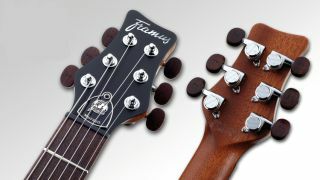 The only exception to that rule is the Framus ES-model, which will still come with Framus Vintage mechanics. Graph Tech Ratio tuned machine heads offer a decisive advantage: For every string, the gear ratio is adjusted individually, ranging from 20:1 to 39:1. This means that with every turn, the pitch level changes by one tone on all strings. You will no longer need to turn all strings at different ratios to tune them - as is the case with conventional tuning mechanics. Tuning the high strings, in particular, is now quicker and easier than ever before. And there's more. Graph Tech Ratio mechanics have a locking technique which secures the string in its position quickly and easily. On top of that, the tuning heads are made of attractive wood options (rosewood or ebony).